SUPER CHEXX Bubble Dome Hockey Arcade Machine Game for HOME for sale Original - Classic! The game play is fast, exciting and realistic as the players on either side control all 5 hockey players and the goalie! It can be played as a one on one game, or two on two. The new electronics record Goals, Shots On Goal, Period, and Running Time complete with digital stadium sounds, announcements and crowd sounds plus digital music playback on the units two audio playback speakers! The running time and cost per game is user adjustable and can be set on free play for home use. 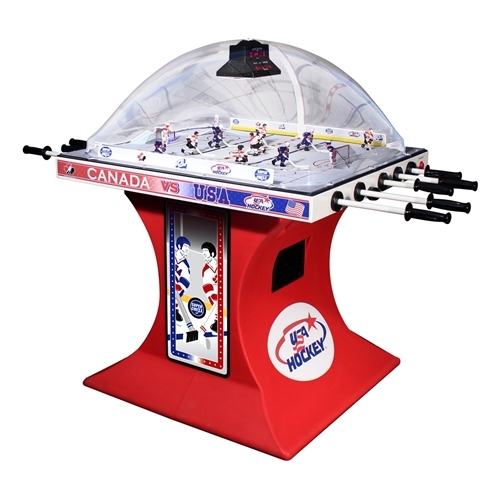 There's an automatic puck return system, overhead dome lighting and if a game is tied after the normal game play, it will automatically go into sudden death overtime - so there's always a winner!ﾠ Also known as "BUBBLE HOCKEY" because of the very unique and indestructible dome that covers the entire playfield.